Some of my Wish Lists have been silly, they're all meant in good fun, but have some truth to them as well. Today, I'd like to be a little more serious with the post, and talk about an ailing legend Kamala. "Just spoke with my longtime friend Kamala [James Harris]. I managed him in 1978 when he first started. He seems to be hanging in there after his foot amputation, due to high blood pressure, not diabetes as reported. Please keep him in your prayers." So that's pretty much all I'm going to ask for this year for Kamala. I hope and pray that he recovers from the amputation and that his high blood pressure gets under control. Unfortunately the big man is done with his in ring career. 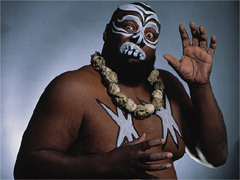 I've written about Kamala before and always enjoyed his gimmick. I certainly hope we haven't seen the last of him. But first and foremost, he's gotta get healthy again. Continue to pray for the big man if that's your cup of tea.